Micro-adjusment on a bracelet..extra holes? Thread: Micro-adjusment on a bracelet..extra holes? I have become slightly annoyed with the bracelet of my new Black Bay 58. My damned wrists fluctuate A LOT...weather, gym, coffee, beer...all that good stuff. Even with the 3 holes on the clasp I can't get a perfect fit. It is currently on the shortest (tightest) setting after adding an extra link. It's still too loose. If I take a link out, I have to have it on the loosest micro-adjustment hole to even fit. The AD told me the 3 holes are exactly one link's size...what's the point?? Anyway, is there anyone brave enough out there to drill an extra hole in the clasp? Am I mad in thinking this can be done with ease? Could it kill the bracelet? Should I give up almost all together and just get wrist implants? Your not the only one who has this issue, I often think the same with my Longines HC and Hamilton Navy Scuba. I can't see any technical problems, it would surely just need a good pillar drill and accurate measurement before drilling. I would think a good watchmaker could do it. First world problem I know, but it really is annoying. I might have a dig around and see if there is someone here who I would be confident in asking. Had the same problem with a Montblanc, drove me mad in the end and moved it on. It's funny how other makes seem to swell or retract as you do without a problem. A hole of approx 0.8mm is tricky to drill, a drill bit as thin as this will snap very easily, particularly when trying to drill stainless steel. Thanks for the insight Paul. Always good to get the answer from someone who knows. Pity though. If I had power to my Milling machine I’d offer, but alas my workshop is still unusable following our house move. It’s not to tricky, but I wouldn’t want to use a B&Q special pillar drill to do it - as Paul said drilling tiny holes in stainless is a tricky job without the correct tooling. Odd suggestion but could a clasp from another watch/brand be made to fit? Normally drilling .8 would be at extremely high speed, but with stainless you need to drill at lower rpm(still relatively high) or you'll burn out the drill. With stainless you'll also need to use quite a bit of pressure and this is when the .8 drill is liable to break. Go carefully, maybe best to purchase a cobalt drill. I dont think you should even attempt to drill it! Not odd at all. I did try that with my Hamilton, to the extent of searching the interweb and did see a clasp that looked identical but with 3 micro holes, but was told by Hamilton that it wasn't compatible and wouldn't fit. Of course, bearing in mind it's the Swatch group, they perhaps didn't want to sell me one because it would dilute the integrity of the brand. I did exactly this mod with a Tissot bracelet for exactly the same reason. I used a 0.9mm PCB drill in a Dremel with a tiny drop of oil and VERY light pressure. The speed was probably a little high but it did work. Getting the hole started in the right place was the trickiest part but I probably could have made a more defined centre punch first. As mentioned, drills of this size and type are very fragile so I knew I was taking a risk, but worst case I thought I'd end up with a small mark from a partial hole that wasn't successful. Would be happy to give it a go with yours if you accept the same risk. Drop me a PM if you'd like. Last edited by boywithabubblegun; 13th September 2018 at 17:12. I can see it ok. As someone who once used a Dremmel to remove the scratched external AR coating from a Sinn 656 crystal I'd have no hesitation in doing this to a watch clasp. Thanks to everyone for their input - appreciate the ideas / guidance. Don't know why they just couldn't have put a couple of extra holes in the damned clasp to being with though haha. Good work! I would feel brave enough to try that. Great job, i'm also one who suffers from this on my Hamilton mechanical. I’d have thought that the 3 holes made up 3/4 of a link - would make more sense? Anyway - I’d give it a go on any watch of mine if it needed it. Is there not an option for one of the newer quick-adjust clasps I’ve seen on some Rolex and Tudors? They seem to adjust a lot and more importantly, in a jiffy. 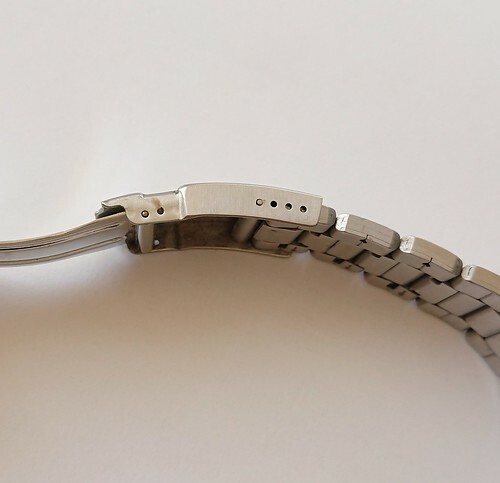 If you get hot, need to loosen the bracelet it can be done without tools. I think there’s a shot of an aftermarket one in the other thread on here “SKX Steel” so prob some aftermarket options too?